Discussion in 'Subaru Levorg News & Announcements' started by VashX, May 25, 2016. The current Subaru WRX STI is a fantastic car, with one huge caveat: You can't have it as a wagon. 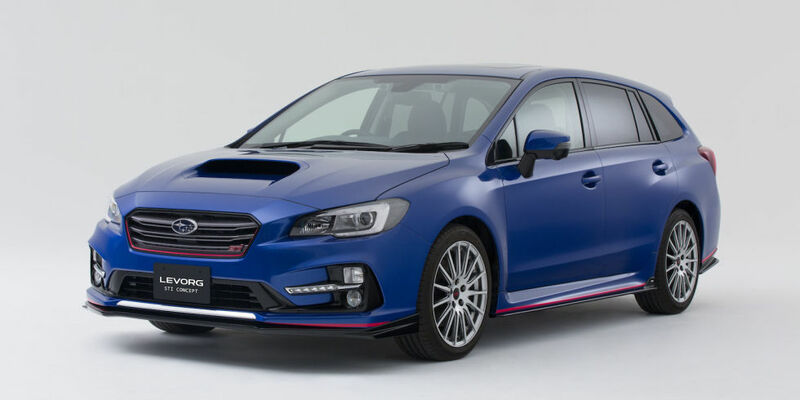 Even though you can get the base-model Impreza as a five-door, and previous STIs were offered as wagons, the current WRX and WRX STI only come in a four-door sedan body style. That's about to change—but only if you live in Japan. In a teaser video published last month and first picked up by Carscoops on Thursday, Subaru announced that it would put an STI version of its Levorg Wagon into production for the Japanese market. Levorg is Subaru's name for the Impreza wagon it sells in Japan and Europe. The Levorg STI is said to be based on the Levorg S Concept (pictured above), which made its debut at the Tokyo Auto Salon in January 2015. According to Motor1, the Levorg S Concept has the WRX's 2.0-liter turbo four-cylinder boxer connected to a six-speed manual, and lots of carbon fiber trim pieces. Wheels are by BBS, as you'd expect with an STI product, and the tires are Michelin Pilot Super Sports. Specs for the production car have yet to be confirmed, but we're very hopeful it will end up with the STI's 2.5-liter turbo four. While U.S. Subaru enthusiasts will (justifiably) be upset over the continued lack of a new STI long-roof in the U.S., there's still hope for the future. Subaru revealed the next-generation Impreza at the New York Auto Show last month, which means a new WRX and WRX STI are probably just a few years away. Let's hope Subaru will gift us the mega-wagon we need and deserve.